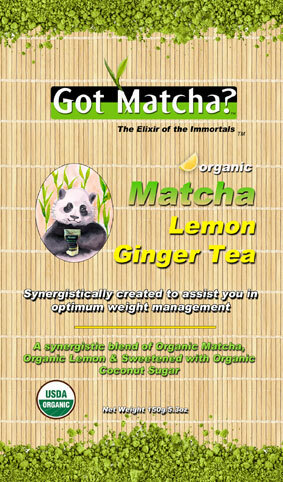 Introducing Got Matcha's "Matcha Lemon-Ginger"
Made with organic lemon peel, ginger &hibiscus, our Matcha Lemon Ginger is a natural matcha weight-loss tea. These four star ingredients work synergistically together to quicken and enhance weight management properties including cleansing, digestion, boosting metabolism and suppressing appetite. 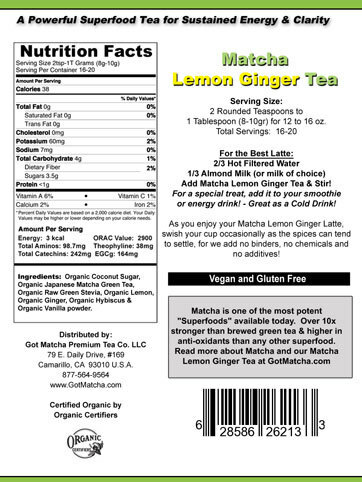 If you are one that is apprehensive to follow a long extreme juice cleanse, such as the lemon juice cayenne and water cleanse, then this tea is ideal because you can still experience the cleansing and weight management benefits along with all of the matcha benefits of this tea, combined with a healthy diet and moderate exercise. Matcha is one of nature's best aids to weight management. Numerous studies have been done over the past couple of years now concerning the matcha weight loss benefit. Matcha tea benefits not only weight management but also improves endurance which directly motivates one to work out! Plus the calming affect matcha has on stress levels causes the body to produce less cortisol and therefore less fat storage. So really it is all intertwined...matcha benefits physical, mental and spiritual which all lead to a healthier and more balance life! Hibiscus has been know over the years for its ability to act as a mild diuretic which essentially helps to flush out excess water weight. Hibiscus also works as a gentle laxative aiding the body with cleansing out stored waste and built-up fats. The combination of cleansing out excess fluids and weight stored in the form of fat cells will help to facilitate your weight loss. For centuries ginger has been recognized for its ability to aid and even tone and strengthen the muscles in the digestive tract. It can motivate over-taxed and inactive livers and is also able to regulate the spleen and pancreas, which greatly aids digestion The Chinese believe that the stomach is key to the body's overall state of health. When the digestive tract is working optimally the body is able break down food rather than store it as waste which turns into fat. When the digestive system is functioning at its best, food can move freely through the body, which reduces bloating and constipation. By keeping the digestive system working more effectively your cholesterol levels can be lowered and maintained because when the veins and arteries have less fatty cells flowing through them cholesterol is less likely to build. Ginger helps to keep your "pipes" clean and flowing freely. Ginger can increase metabolism because it is able to stimulate various enzymes which can aid metabolism. The better your metabolism, the more calories you will burn. The benefits of lemon are numerous! Lemon peel is another gift from nature that has been known for its ability to aid in digestion and even bad breathe because it can destroy bacteria in the intestines and the mouth. Lemon peel can influence natural weight loss due to its high citric acid content. This citric acid present in lemon peel improves the conversion of stored fat and improves circulation. Coconut Palm sugar is an all-natural, whole food. It contains no chemicals, no additives, no preservatives, no artificial flavors or colorings. It is unrefined and not highly processed as traditional sugars. Organic Coconut Palm Sugar is derived from the sweet nectar of the sugar blossoms that grow at the top of the tropical coconut palm tree (Cocos Nucifera). Traditional local farmers climb high into the canopy of swaying coconut trees and harvest this sweet nectar by gently slicing open the flower. This nectar is then converted into its traditional crystalline form through boiling the watery sap that drips from the cut flower buds of fresh coconuts. Coconut Palm Sugar is naturally low on the Glycemic Index (GI), which is important to those who are concerned about weight control and diabetes. Coconut Palm Sugar is rated on the glycemic index at 35, whereas honey is 55 and typical cane sugar is 68. The low glycemic index of coconut sap sugar is especially helpful as a healthier alternative to those who are pre-diabetic and/or diabetic; unlike all sugar cane based sweeteners (refined white sugar, brown sugar, muscovado sugar, turbinado sugar, demarara sugar, sucanant sugar, molasses and dehydrated cane juice sweeteners) --- all of which have a high glycemic index rating between 65 to 100 per serving! Coconut Palm Sugar delivers a slow release of energy, which sustains the human body through the daily activities without experiencing the "highs" and "lows" so often associated with cane sugar. Coconut Palm Sugar also has a nutritional content far richer than any other commercially available sweetener. It is particularly high in Potassium, Magnesium, Zinc and Iron. It is also a natural source of vitamins B1, B2, B3, B6 and C.
Coconut Palm sugar has an exotic flavor profile with wonderful notes of light butterscotch and caramel and add a great flavor profile to our organic Matcha blended teas. Coconut sugar is a wonderful, nutrient-dense natural sweetener. If we were to define "nutrient dense", it would mean a food that contains a large number of nutrients (eg: vitamins, minterals, amino acids etc) for relatively few calories. While most sweeteners, especially all artificial and synthetic sweeteners, are devoid of any nutrients, coconut sap sugar is RICH in vitamins, minerals and amino acids. Coconut sap sugar or palm sugar, is now considered to be one of the best natural sweeteners, being touted as a "wonder sugar" because of its many health benefits. For more information on our Coconut Nectar sugar, please click here. This Matcha Lemon-Ginger tea can be drunk as a hot matcha latte if desired by mixing with milk and water and then heated. However, what we have found to be the most effective way to incorporate it into your matcha weight loss regime is to add about 2 tsp to 1 Tbsp of the tea blend per 12 ounces of water and drink throughout the day...try blending it with ice for a nice cold treat! Matcha as an iced green tea latte is incredibly refreshing! Drink a few ounces 15-30 minutes before meals to suppress appetite and help break down the fats in your meal. Drink 15-30 minutes after a meal to increase digestion and aid in cleansing. Drink a few ounces every hour to increase your metabolism and keep your hunger controlled. There is no need to add any milk – tastes great simply mixed with water. Make a double batch in a large water bottle and take it on the go. Also makes a great matcha green tea smoothie if you blend in frozen berries and vanilla protein powder! 2. We add 1 tablespoon of the Matcha Lemon-Ginger and stir. Or you can blend it with ice instead of the water for a matcha slushy! That is all there is to it! Simple, quick and tasty. Where the Matcha can tend to clump a bit when mixing, with our Matcha Lemon-Ginger, the spices and the Coconut Sugar act as a perfect blending agent, so you have no problems with clumping.